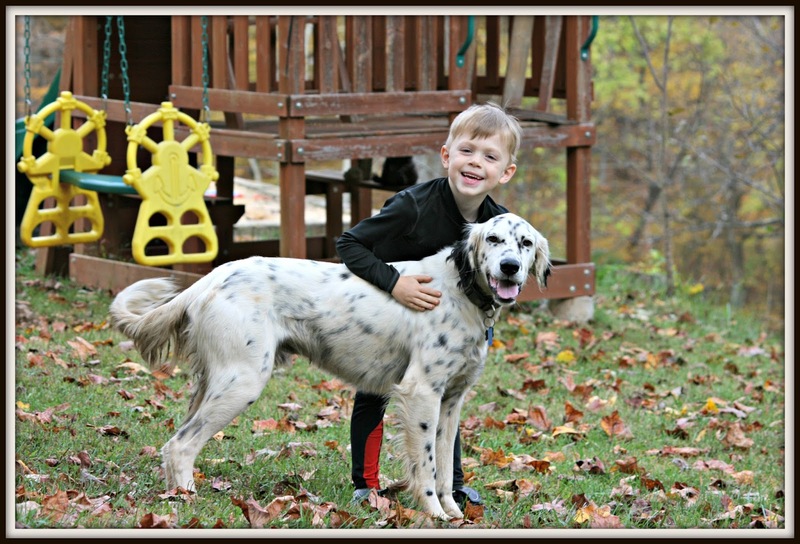 Last June we took in Bo, an English Setter, who lost his family in a tragedy. He's been the goofiest of dogs - chasing butterflies and leaves, leaping through fields, trying to jump on the schoolbus daily, and opening any unlocked door in our house. It took me five months to teach him how to sit. But he's sweet with the boys and affectionate when he isn't obsessed with birds. A couple of weeks ago, Paul went out of town for work. I took Reid to lacrosse, and we got home around 7:40. The boys and I rushed in the house, to begin the business of getting ready for bed. A strange sound rumbled from the back porch. What was that? Was that Bo? Growling? Couldn't be. I had never really heard him growl before. I wanted to investigate, but with bedtime looming and the business of brushing teeth and getting into pjs, I became distracted. A bit later the boys were all tucked in and I went up to my room to do some reading. I had just settled into the pillows with the cats and a book, when Bo started barking like crazy. Sometimes he barks at deer, so I didn't think too much about it. But then I heard yelling in the woods on the property behind our house. I turned off all the interior lights, checking all door locks along the way. Then I turned on all the exterior spotlights. Bo was barking on the back side of the house, so I went back upstairs, cracked a window, and watched Bo from my viewpoint, listening carefully in between his barks. Imagine my alarm when in the grainy darkness I could just make out Bo chasing a pair of running legs down the driveway. I immediately contemplated my options. I knew it would take the sheriff a good 15 – 20 minutes to arrive, and then he wouldn’t necessarily be willing to go traipsing along our land in the dark. Instead I texted a neighbor, a federal park ranger, to see if he was home. He called me right away, and said that he’d come over to check things out. Over the next hour Bo continued to pace and bark, but the yelling and voices stopped. I got a text around ten that said my neighbor was back home, that it was a long story, but that he had taken care of the situation. It wasn’t until the next evening when Paul returned home that we got the full story. I think he didn’t want me to be scared all night. It didn’t matter, though. I couldn’t sleep that night, and was up every hour to check on things. Know who else didn’t sleep? Bo. Every hour I got up, Bo was sitting at the top of the driveway, quietly keeping watch over the horse pasture. He didn’t go to his snug bed on the porch once. Even at 6:30 the next morning, he was still carefully keeping watch. Our neighbor told us the next day that he had snuck up on our land from the backside. Even though he has encountered numerous crazy situations for his job on the Blue Ridge parkway, he said even he was taken aback when he saw the man in our horse pasture. Missing clothes, covered -- dripping in blood (like something out of a horror movie, according to the neighbor), drunk and delusional, this is the man our dear dog chased away. Our neighbor detained him until the police and an ambulance arrived to take him away. It takes my breath away to think of how our sweet, affectionate Bo protected his family that night, and then sat up all night making sure the threat didn’t return. Some people may think that Bo was lucky to get a new family after he lost his, and flunked out of several other attempts at rehoming. But the truth is that we were the lucky ones to get him. I can’t imagine a more valuable fur friend than the one that puts his own life on the line to guard his family. Had it not been for him, and our neighbor, things might have turned out very differently. Not even a high tech alarm system could have handled the situation like Bo did. So guess who got a big batch of home cooked bacon and a good dose of hugs the next day? Readers, have you ever had a dog do something amazing for you or a loved one? Our dog goes crazy when someone comes down the long drive way and I think she would bite someone if they didn't heed her warning. Sounds like you have a real good dog. It just depends on where a deputy happens to be so it could take 10 minutes or 20 minutes for someone to show up even where we live. Pretty bizzare, I live very far away from everything, so like it when the dogs do bark. sometimes it is just a stray animal, and luckily no humans. WOW. Speaks volumes of how Bo has bonded with your family and how grateful he is that you took him in. That was an incredible story. You were lucky to have Bo AND your neighbor to help rectify the situation. Sweet sweet Bo! I tell everyone dogs are the best and you will never have to come home and wonder if someone is in your home. A dog will let you know something's up. Back in Orlando, late one night, I was in bed asleep and Roxy and Rambo started barking and growling. They were about to go right through the sliding glass doors from my bedroom to my back screened in porch. Turned out someone had broken into our screened porch and grabbed Kyle's bike was carrying but, the dogs must have scared them off because they dropped Kyle's bike by the gate to our fenced backyard and were gone! Kyle and I were home alone at the time. Love our puppy dogs!! So glad your neighbor was home and thank God for Bo! Amazing! Way to go Bo! What a neat --but scary story.... So glad that Bo was there to 'protect' his family... What did you find out about the man AFTER the fact? Would he have tried to break in???? Wonder what he wanted.... SCARY!!!! Is your hubby out-of-town quite a bit? If so, you might need to invest in an alarm system. Whew that was scary!! Yes I have had more than one amazing furry family member act in my lifetime. They are just the best! We have them for many reason but protection is one. As you put it an alarm system could not have done what your Bo did. I am glad you had him and a good neighbor! What a good dog! So glad y'all have him. That would be so unsettling!! I am always surprised when our sweetheart of a dog has acted out that way. They love their families!! This is the best story ever!!! We love Bo! And Bo loves his family,,, It's so evident! oh, sweet boy. good, good, good dog. i fear for things like this... so glad the man was found and apprehended. What a story. It's a good dog you have there. A protector for sure! What a GOOD BOY! How wonderful of your neighbor, too, but what a dog you have. ps - I'm so glad you're okay. What a Great Dog. So did you ever get the full story of what and why? Sounds like Bo is a keeper for sure and a damned good looking dog to boot!!! OH my God! you are so lucky to have a loyal dog and a good neighbor. Bo is a hero! And handsome too! So glad your neighbor knew what to do. Fabulous boy! I used to walk an English setter - they are wonderful, loyal, loopy, affectionate dogs, and Bo is a fine example! Good gravy. I'm so so so so glad you have him. And the neighbor too. He deserved bacon, without a doubt. What a sweet heart and a wonderful addition to your family. Oh my GOSH! Sending you an e-mail. This brings tears to my eyes. I'm so thankful he was on watch for your family. What a sweet and smart boy!!!! I'm behind on the blogging, but we just took in a rescue ourselves....not sure if she'll ever protect us like your Bo did, but she is a sweetheart. So glad you shared this with us. I am so glad you all have an amazing dog and great neighbor. That sounds really scary. Oh my gosh, Lisa, that is scary! You are indeed lucky to have a dog like Bo just as he is lucky to have a family like yours. I'm so glad Bo and your neighbor were there. Lisa: This story had me on the edge of my chair! Thank God for you having such a caring and willing neighbor to help, and yes, what a nice dog. Truly. Glad it worked out. Wow, how frightening! Bo to the rescue. I miss my childhood dog daily. One day when my mom decides to retire and stop working, we'll have another dog in the house. They truly make the best loyal companions and protectors! That's a good post and I'm sure glad it ended as it did. There are a lot of mentally ill people out there, and they turn up in some unexpected places. Our local hospital now uses armed guards in the emergency room because "10-13s" are being brought in so regularly. Psychologically disturbed people, drug addicts having withdrawals, people "off their meds" can all get violent and are completely unpredictable. I'm sure glad you and the family are ok.
You were lucky to have him! That was scary.